For the two previous years, straight after his retirement, Niemeyer coached Milos Raonic and helped him rise in the rankings from the high 300's to around 150 in the world. We were hoping to see similar results in my game. I first started working with Niemeyer in late December of 2010 when my official ranking was 330, 60 spots below my career high. Niemeyer was a hard worker as a player and brought his fierce competitiveness to the practice court as a coach as well. He was demanding and often quite tough on the practice court but this is absolutely necessary for a player's development. Unfortunately for me, he could not travel for more than 15 weeks (although he ended up traveling for a few weeks more) during the year as he had a wife and baby girl in Montreal. Regardless of these travel restrictions, which were not ideal for me, we dove into it and my dad and I were convinced this would be a good move. So, just like that, the 13 year period that I spent with my dad as my coach, had ended. He was the key to my development and I was very fortunate to have had him as my coach. He prepared me well and opened the door for me to take the next steps in my career. Now we looked towards the future as it was once again time to leave our "comfort zone". Niemeyer came to Florida as Davis Cup Coach that December and worked with me there for about 10 days before I took a flight to Montreal and trained with him at the National Traning Centre. Since Niemeyer was an official Tennis Canada coach, working with him meant my training base would have to be moved. So, naturally, Montreal became the place I would go back to and train when not at tournaments. After a month of training and a slightly later start to the year, I went on the road and quickly started having good results. I started going deep in Challengers and my ranking was moving faster than we expected. 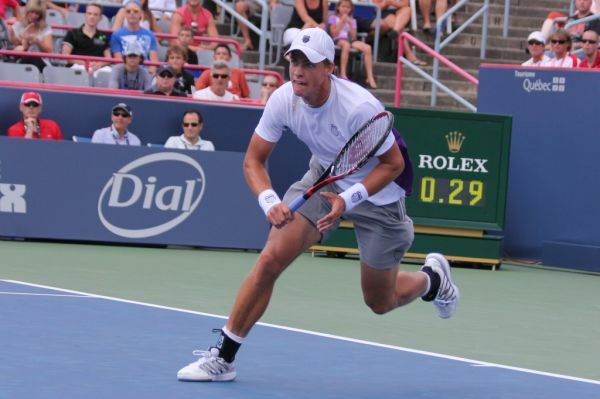 I did not take long before made my first Challenger semifinal (followed by a several others) and then, in the summer, had my first ATP win over world #23 at the Masters in Montreal. I followed that up with a 2nd Round showing at the US Open (coming through the qualifying), some great Davis Cup performances, and a few other Top 50 wins at ATP events. By the end of the year I found myself ranked at an exciting 110th position. Since Niemeyer could not travel a full tournament schedule, I would occasionally (6 weeks a year or so during the 2 year period with Niemeyer) go with Tennis Canada coach, Guillaume Marx, to the tournaments that Niemeyer was unable to accompany me to. Marx, a Frenchmen like Borfiga, was hired by Tennis Canada to help run the NTC as head coach. He definitely helped me during the weeks we spent together and I have great respect for him as a coach and as a person. The end result of working with Niemeyer, through lots of long hours on the practice court, was that all my strokes improved and I became a much better overall player. The technical improvements I made under Niemeyer were obvious. I started hitting my forehand bigger, serving better, and was more solid on the backhand side. It didn't take long everyone to see the difference it was making in my game. Most importantly, I was more confident on the tennis court. Before Niemeyer, I was timid and, even though knew I had potential, often had low self-confidence. But this improved dramatically and quickly under his guidance. Being confident and somewhat intimidating himself, Niemeyer's demeanour and creative vocabulary rubbed off on me and I was no longer intimidated or "scared" of other players. He fed me with high compliments and soon, I began to believe them. I knew my coach believed in me, and this was huge. Under his guidance, I began to see and believe that, although I had much room for improvement, could make it higher in the rankings. This was a career changing 'niche' that I really benefited from by working with Niemeyer. As the 2011 tournament calendar ended and plans for the off-season training began, we started discussing where we would train. This decision was somewhat influenced by the fact that Niemeyer had a young family in Montreal and so, being restricted with travel as it were, we based ourselves at the NTC in Montreal for most of the off-season. We decided we would go to florida for the last 10 days of the preparation before going to Australia. Throughout 2012, we mixed Challengers with ATP events. I had little to no success at ATP events and, although I played close matches against high ranked players, was not feeling too comfortable on the tour. Just as when I first went into the Challenger scene from futures, I felt out of place and in an environment (with top players) that I was unfamiliar and uncomfortable with. After a disappointing run of ATP events, I went back to Canada for a Challenger in the town of Granby. I had won my first Challenger in March and followed that up with another title in Granby to reach a career high of 85 (a ranking I held for a few weeks). 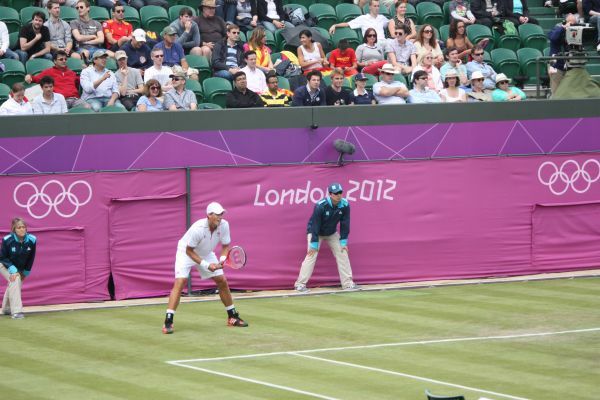 After the Challenger in July, I went to London and participated in the Olympics. This was an extremely special and memorable moment in my career. The tennis event was played at Wimbledon which made it even more special. I played doubles with the great Daniel Nestor (who, being in the top 10 doubles ranking, could choose any Canadian to play with and chose me) and received a singles wildcard (WC). Fresh off my Olympic experience, the next stop was Toronto for the Rogers Cup masters event where I again was able to get another top 25 win before losing in the second round. However, it was here that Niemeyer was forced to give me bad news. With a second baby on the way and a young family to raise, he could no longer travel the following year and therefore could no longer be my coach. There is no denying that, under Niemeyer's guidance, I made great strides in developing my game at the professional level and seeing my game improve and my ranking rise the way it did, was extremely satisfying. So, as you can imagine, this was very disappointing news. Not only because I respected him so much as a coach but because we had grown extremely close over those two years together. He was much more than a coach to me at that point; he was like a brother. It was truly an incredible two-period for me and it was filled with many great times. So, with this newly developed bond, there was no denying that it was difficult for both of us when he had finally dropped the news. With this in mind, we continued on with our plans to finish the rest of the year together while beginning negotiations with Tennis Canada on searching for a new coach. There were several names and options that came into the mix quite early. I had spoken to a few through email and skyped with a couple as well. Nearing the end of September it seemed that we were coming close to a choice when, suddenly, Louis Borfiga, the director of Tennis Development who was brought in from France like a fine wine, had a new name for us that he thought would be a good option to look into. This new name was Frederic Fontang, the long time coach of Jeremy Chardy. This was exciting to me because he was well respected and had been at the top of the game both as a player and a coach for many years. My ranking had been hovering around 120 for over a year now and I was excited to see what Fontang could bring into my game. In the middle of October, Niemeyer and I had officially spent our last week together and I had begun a 4 week trial period of with Fontang.